Spirit states that these are the main human concerns. They are in this order from left to right. HEART is the first concern and has to do with how you feel about the contents of your life. You favor personal fulfillment over physical or spiritual health. You wonder if you are happy with what you are doing and is there a peer group and sense of belonging. This refers to an overall sense of happiness and believing that your life is valuable and worth living. HEALTH is next and is focused upon your overall feeling of fitness. You have chosen your level of exercise and activity and will make adjustments to these decisions over time. This also includes the presence of illness, injury or chronic health problems. Literally, you would rather be happy than healthy. LOVE is next. This is romantic love, sexuality and feeling your preferences are accepted. You are able to function in life without a romantic partner or sexual expression as a couple as long as the first two concerns are taken care of. Basic happiness and health will fulfill you for a time before finding love or between relationships. SPIRIT is the last concern. You experience and challenge life to find happiness, health and romantic love, only then to consider the presence of God and a purpose in life. Some people don’t experience this concern and are happy to find fulfillment with the first three conditions alone. You may not be one to question the meaning of life. Often the questions about God, faith and religion will surface later in life once you stop to consider death and your mortality. Many people either don’t have spiritual questions or they prefer not to pursue them. You are on this site because you want this information and you have concerns about your spiritual health. Many of you are very focused on your afterlife. We have fielded questions before about absolution. It seems time to address this topic again. You have been addressing these four concerns throughout your current earth life. You have found some modest success with the first three conditions and now have questions about where you will go after death. You may have grown up with the idea of Hell. Your prior religious experience may have instilled the idea that you must follow some rigid rules or end up with the Devil. No room for growth or mistakes. This is not true and never has been. God loves everyone. Each person is entitled to reside in Heaven and return to earth for more learning. Your fear of damnation has no basis. We try to alleviate your fears and reassure you that your life is eternal. Some of you are still using the perspective that being a sinner will confine you to Hell. To Us, you are learning. Your life is intended to raise you up closer to God. Salvation is always possible. You may have harmed others or have lived an unsavory life but you always may turn it around and seek absolution. It is never too late. We offer you the truth that there is no Hell. Everyone returns to the other side and resides in the levels of soul existence. There are darker levels and lighter ones. If upon your death you were harming others, entrenched in drugs or alcohol or perhaps a suicide, you would transfer to the lower levels. You would then have your option to learn and grow and rise up to the lighter levels if you wish. You always have the option to improve your soul status. You are never doomed to the darkness. Some souls prefer the darker, more negative energy and continue to behave in a manner that is not “of God.” This is their choice. No one insisted that they continue this way. It is possible that one may not turn to the light because the heaviness of the plane that they are on is not conducive to greater health and healing. They would need to turn toward the light or search for it. Depression, suicide, mental illness and substance abuse may still cloud their thinking and they are not aware that there are other options than the lower levels. Without a certain amount of healing they may feel lost to God. You wonder why there are drugs, alcohol and mental illness in Heaven. Actually, everything that is present here may still be present on the other side. People may still smoke, overeat, abuse others, fight, intentionally harm someone and create more negativity if they wish. You, as a soul, would need to choose a better existence. You may create any environment that you wish. It is your choice to start in the lower levels and choose to find the lighter, brighter ones by making changes to your vibration and intent. A soul living in the higher levels may travel down to the lower ones. The souls in the lower levels may not travel to the higher ones unless they do the work and earn it. It is possible for a loving mother figure, healer or guide to search the lower regions for someone in order to turn them toward God. These higher souls would not wish to stay in the negativity for very long without the risk of diminishing their own light, but it is possible. So, how does this affect you? You are not doomed to Hell. The fear that you will reside surrounded by hellfire for the rest of eternity is wholly untrue. Do you enjoy the negative energy? Are you making bad choices and harming yourself or others? Do you cope by abusing drugs or alcohol? Then it is time to make changes to your choices. Reciting any scripture or sitting in church any day of the week will not keep you from the lower levels if that is how you behave. An actual change, deep inside your being, would be required. It is your choice. No one makes this determination for you. Are there considerations for people who are of lower intelligence, suffering a mental illness, or lacking sufficient maturity? Yes. Of course. There is no Hell. You are never damned. Your behavior may reflect the goodness of your soul. Have you been given ample opportunities to change? Are you making amends but may suffer a setback occasionally? Are you acting in accordance with an agreement with your soul group? All of this is taken into consideration. God is love. God is forgiveness. God will not turn away from you. If you fear damnation then you must have concerns about your behavior. Make some changes. Do good and be good. Be the positive, forgiving person that you want to be. Make improvements and take each day to make something better. You must do the work. Just wishing for salvation does not make it happen. You have to behave with a higher intent to find your place with God. As you find ascension, your energy more closely aligns with God and you find yourself in the higher levels of the other side. Pray, meditate, cleanse & clear your being, be grounded & centered and align with your life chart. If you have disturbed behaviors then you must find help and treatment. Seek counseling. Discover the roots of your dysfunctional behavior and begin to heal. This is what We refer to as “doing the work.” It is not ok to continue in a dysfunctional behavior pattern and claim to be unable to change. It is not ok to blame others for your negative actions. You are not at the mercy of your past experiences. You are an adult and you are responsible to make the necessary changes. No one else may do this for you. You are not destined for Hell but you are responsible to strive to reach the higher levels of Heaven. To insist upon mediocre results is not expected. To overcome is. Release your shackles of human imperfection. You’re are an eternal soul and you may rise above this dark and negative realm to more easily find God. No longer fear damnation. The only thing to fear is inaction. As long as you are making a genuine effort, God will welcome you home. The aura is packed with all of your emotions, fears and problems. There are layers upon layers of thoughts and feelings which allow or repel any incoming or outgoing information. Authentic communication requires more open avenues. Being out of touch with normal expression causes a backlog of information which you would need to have authentic communication with the spiritual, physical and internal planes. Not being in touch with your realms of existence will cause you to be out of touch with your chosen path. “Detached” as it were. This would cause you to misunderstand and misinterpret the interactions that you have with other people and your environment. 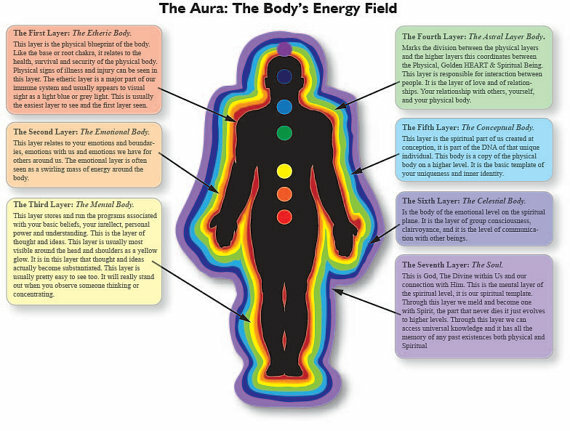 Cleansing your aura is the same as cleansing your physical body. Flushing out the stagnant, dark energy is essential and then refill with bright, healthy White Light. You must remember to flush all around and through your being. Many of you hold negative energy in your tailbone, shoulders, upper back/neck and hips. If you cleanse only the areas visible to you in a mirror, many darker areas will go untouched. As you can see from the chart, a healthy aura is full of color. These areas are intended to have bright, vibrant, fluid colors. Dark or muddy hues will not promote good health. Practice flushing out unhealthy colors and promoting positive, energetic ones. As with your physical body, stagnant colors may actually form a block or barrier. Please don’t assume that flushing liquid colors will complete this task. You must also dislodge or break apart any solid energy that you have created. You may wonder why you would create a solid barrier inside your own body and aura. This is usually some type of coping mechanism. You resist any change because you believe that you can handle what you have on your plate currently. When things start to change, you resist this change by blocking it with actual physical barriers. In your misguided need to keep things the same you actually cause more problems. True life and effective coping is fluid. Information and energy must flow in and out. There is a constant communication with your being and the world, spirit, departed loved ones and God. An analogy is if you resist any change you may be out of touch with reality. Let Us say that you have become accustomed to warm weather. Then, the temperature drops to below freezing. In your misguided way of blocking change you neglect to dress more warmly and you experience a bitter cold that you are intentionally unprepared for. You may get sick or suffer some other malady. Why would you place yourself at risk? Doesn’t responding to change make you more healthy and effective to carry out your life goals? This analogy is rudimentary but Our intent is to deliberately shake your mindset. Resisting change leaves you out of the Divine flow of energy. Your mental, emotional and spiritual growth needs constant communication with the Universe. Chances are that you may see this disabling mindset in someone else but you do not recognize it in yourself. You’d be aghast at someone trying to cope with their current environment by using outdated and ineffective coping. You may wonder why they are so out of touch. You may even find it humorous. Your barriers to change are just as ineffective. In order to be a part of the future flow of energy you must ALLOW that energy. Flush all of your energy out and then allow God to refill you. This will happen in an instant. You will not be left bare or unprotected and God will fill in your physical body and aura with the energy that you need. You must envision yourself with stunning, vibrant, fluid light. Sitting on a rock or even being part of the rock will not get you salvation. The energy is far too dense. You must be able to rise up and float in order for your intended existence to actualize. We sense some resistance to this concept. Some of you feel that covering yourself in armor is actually beneficial. This would be great if the negative forces against you were actual arrows or swords. Your ascension requires you to successfully cope and release unseen energy. Your suit of armor is actually counterproductive. This concept may take some time to grow accustomed to. This is ok. We will definitely stay on this topic until there is a better understanding. The idea that you may flush your inner body of stagnant energy is acceptable to you but flushing energy from your aura takes more thought. It truly is the same concept. And, it truly is just as important. Celebrate what we have achieved in this new world. There are many goals, agendas and plans. We all seek select goals for ourselves and other goals for our community and more goals yet for the world and universe beyond. What has been done? What is attained? Can we check off any goals for 2012 yet? Time is moving very quickly. We are in turmoil much of the time. Have you learned yet how to accomplish things in this time of fluctuation and imbalance? Have your days blurred into other days? Has time gotten away from you? Did deadlines pass without your recognition? Precisely. Just like many of those in your social circles. One may have to adjust to working when out of balance and with unfamiliar energy. Hopefully, you will adjust and continue to be productive in your work environment. How are your children doing in classes? Does it sound similar to the fluctuations that you are experiencing? Band together and discover ways to be successful in these times of unreliable energy. Be certain to ground yourself. Teach those in your family, work and social circles how to ground themselves. These fluctuations in energy will last for a while longer. Perhaps for 6 more months or less. What is happening to the darkness during this time? Are the darker beings finding footing themselves or are they being flushed away by the turmoil? They are surviving just as you are surviving. They may find stability themselves against the uncertain energy waves that buffet us all. Many of them will survive, also. The key to surviving in the Light is to ground yourself to Heaven as well as Mother Earth. The darker beings don’t have the Light to guide them. They must merely cling to their own footing and forego the assistance of the Higher, Divine Beings. You may see them flounder. You may catch a glimpse of them tumble to the ground and try in vain to stand back up. They will disclose themselves just by being more in flux than the beings of Light such as you. They will be much easier to spot. Once you have seen them for their true self you will know to shield yourself against the darkness they emanate. This is a time of great learning. Take notes! See others for who they truly are. Keep yourself in balance. Pray, meditate, ground yourself and seek guidance from the Light. You are much more likely to survive this time of turmoil if you hold onto your faith. Just watch the world around you. There will be many things happening to pique your interest. Enjoy the show and don’t forget to shelter yourself from the darkness of others. They will seek to grab ahold of those who appear more stable than them and you will be at risk of attracting them. Use White Light, prayer, outward facing mirrors, imagined blocks and barriers…whatever works best for you. Keep the darkness at bay as you prosper and uplift yourself.